VIN Database, please help keeping it updated!, Pride and joy or parts car? We'd like to know about it! Please help us to keep our VIN Database up to date! You can also search the database using various criteria like year, type and even color. In order to add a new VIN, simply click on the "ADD a new VIN ..." link. 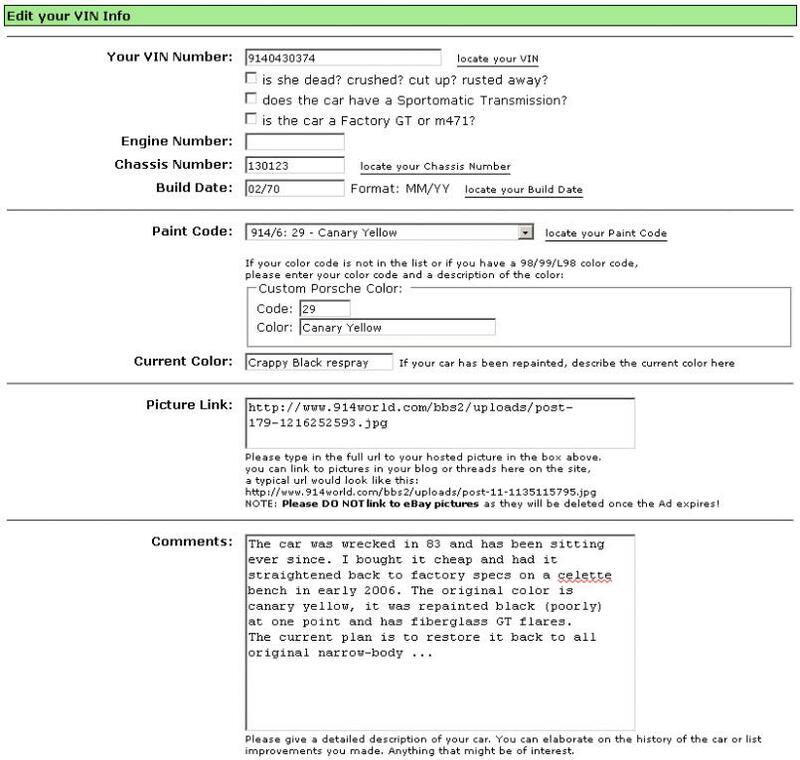 The section "Your Own VINs:" will show all VIN numbers you entered. You can edit your VINs by clicking on the number itself. - Details: Parted out or crushed? Factory GT or m471? Sportomatic? If you have records of cars that you have come across in junkyards or cars that you parted out, please add those to the list as well and mark them "is she dead? crushed? cut up? rusted away?". someone needs to come by and look at our over 200 parts cars and titles and record every one and add them to the data base. It will certainly take all day. Any volunteers? I need to come out and visit anyways. It's on my list of things to do. This is certainly not what I expected down here. I will be heading down sometime in the next month of April to either bring a motor to Len/Jake Raby, just tour the aircooled sanctuary and get a feel for how they do things to build a turbo type IV. The reason depends on what I end up doing with my car. On that list was stopping by to see George and look over said 200 parts cars for something to drag back home later this year. I can start, if you would like since I am going to be getting OCD on them anyways. George, you have a PM coming. This will be a major project for sure, and quite a valuable one. Before you go, please contact me regarding a few details that might be useful to check out. found that on wsrp...not sure how up-to-date it is. How does one edit information on a VIN that I currently own but is shown as being owned by someone else? You can't edit someone else's entry. If Dr 914 puts me up in some accommodation and pays the air fair I'll come to Atlanta and do the audit on all the 914 cars and motors. Is there a better way to add yet recorded VIN's/cars that you dont own? For instance cars that you spy dead in a bone yard. Right now you have to record them associated to ...ME, & notate that they have no affiliation ? I can't seem to get my info to update. I went to put in the paint/engine/chassis stuff, but it doesn't stick. I hit [Update My VIN] and when I look at it afterwards, there's only the same VIN info that's been there forever. I even tried in a different browser... is it busted, or am I doing something wrong? I just tested updating your VIN and it worked fine for me. VIN Search. My first car was a 1973 914 2.0. I sold it in 1982 and believe I have again found the car. Unfortunately, I no longer have my former car's VIN. I have the VIN of the car I found and would like to obtain a VIN search that shows where the car has been registered throughout its life. Does anyone know where I can obtain such a VIN search? I found an error: there is a silver car listed with VIN 4762901552 which should have VIN 4762924483. The correct VIN is in the description. Vin added no idea of build date,maybe some would know that from the VIN so I could update?,cheers to you Sir Andy for this database.